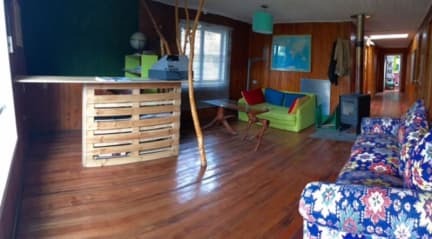 Paradise Pucón Hostel is interior provides ultimate comfort in the large living room with a cozy fireplace and TV. We also have a large dining room for you to enjoy breakfast and other meals. The internet is available to you free of charge. You will also find our rooms are cozy and very clean. If you prefer to simply relax you can lay in one of our comfy hammocks and close your eyes and experience the fresh Patagonian air. Either way you will certainly enjoy the lush gardens on the lawn and the beautiful scenery of the Andean mountains. 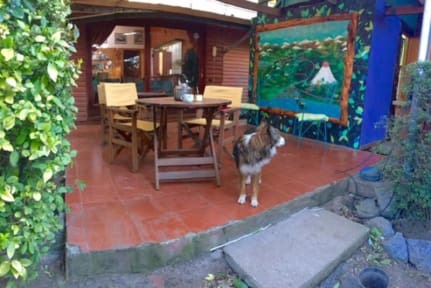 Paradise Pucón Hostel only a 3 blocks from the main street where you will find all of the best restaurants and bars that Pucón has to offer. We are also located two blocks from the beach of the beautiful Lake Villarrica, and within 6 blocks of the bus stations for both Jac and Turbus services. We have 7 comfortable rooms, privates with bathroom, privates with shared bathroom and two types of dorms; 4 bed mixed dorm and 6 bed mixed dorm. Hostel heeft een prettige sfeer met open haard. Een personeelslid was nogal lui, waardoor we een keer geen brood hadden bij ontbijt en een keer er geen ontbijt was klaargezet op de dag dat we uit checkten. Bedden zijn goed. Badkamers mogen vaker schoongemaakt worden. Locatie is is prima.